A cathedra (Latin for "chair"; from Greek: καθέδρα kathédra, "seat") or bishop's throne is the seat of a bishop. It is a symbol of the bishop's teaching authority in the Catholic Church, the Orthodox Church, and the Anglican Communion churches. Cathedra is the Latin word for a chair with armrests, and it appears in early Christian literature in the phrase "cathedrae apostolorum", indicating authority derived directly from the apostles; its Roman connotations of authority reserved for the Emperor were later adopted by bishops after the 4th century. A church into which a bishop's official cathedra is installed is called a cathedral. 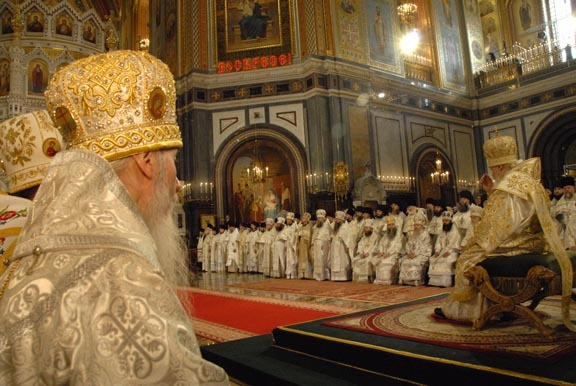 The Joint International Commission for Theological Dialogue Between the Catholic Church and the Orthodox Church makes use of the term cathedral to point out the existence of a bishop in each local church, in the heart of ecclesial apostolicity. The definitive example of a cathedra is that encased within the Triumph of the cathedra Petri designed by Gian Lorenzo Bernini in 1657, and completed and installed in St Peter's Rome in 1666. As early as the 8th century, an ancient wooden chair overlaid with ivory plaques depicting The Twelve Labours of Heracles and some of the constellations  was venerated as the episcopal chair of St. Peter. It is a Byzantine throne with framed fragments of acacia wood encased in the oak carcass and reinforced with iron bands. It was long believed to have been used by the Apostle Saint Peter, but the Vatican recognises that the chair was a gift from Holy Roman Emperor Charles the Bald to Pope John VIII in 875. Several rings facilitated its transportation during processions. Pope Alexander VII commissioned Bernini to build a monument to display this relic in a triumphant manner. Bernini's gilded bronze throne, richly ornamented with bas-reliefs, encloses the relic. On January 17, 1666 it was solemnly set above the altar of Saint Peter's Basilica in Vatican City. Greater than life-sized sculptures of four Doctors of the Church form an honor guard: St. Ambrose and St. Athanasius on the left, and St. John Chrysostom and St. Augustine on the right. Celebrated on February 22 in accordance with the calendar of saints, the Feast of Cathedra Petri (the Feast of the Chair of Peter the Apostle) honours the founding of the church in Rome and gives thanks for the work of Saint Peter. The Chair of St. Augustine represents one of the most ancient extant cathedrae in use. Named after the first Archbishop of Canterbury, St. Augustine of Canterbury, it is made of Purbeck Marble or Bethesda marble and dates to sometime between the 6th and 12th centuries. Those who argue for an older date suggest that it may have been used to crown the kings of Kent. Canterbury Cathedral, in which the cathedra is housed, maintains that the chair was once part of the furnishings of the shrine of St. Thomas Becket, since dismantled. Since the Middle Ages, it has always been used in the triple enthronement of an Archbishop of Canterbury. He is seated on the throne in the quire as Diocesan Bishop, in the chapter house as titular abbot, and in St. Augustine's chair as Primate of All England. This is the only occasion in which the cathedra is used. 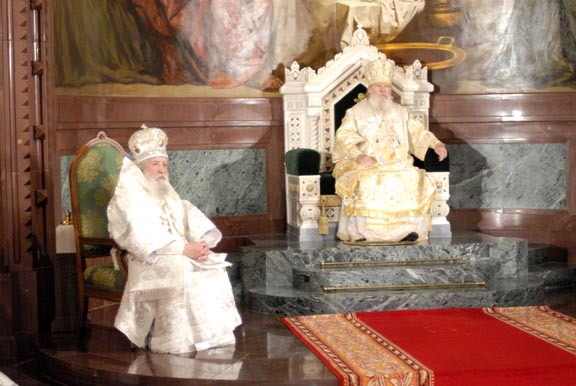 A second cathedra is used for other occasions at which the archbishop is present. The term ex cathedra, meaning "from the chair", is used to designate official pronouncements of the pope intended for a world audience. The cathedra symbolizes the bishop's apostolic authority to teach. In the case of the pope, the expression "ex cathedra" has special canonical meaning within the context of the Roman Catholic Church, which attributes infallible teaching authority over the whole church rather than his local Church of Rome. According to Catholic dogma, the pope's statements ex cathedra are infallible in matters of faith and morals. Russian Orthodox kafedra in the center of the nave with its Eagle rug. Tribunes, bishop's cathedra and stasidia at the basilica of Hagios Demetrios, Thessaloniki. 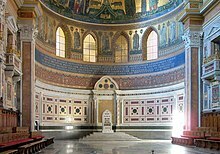 The traditional position of the cathedra was in the apse, behind the high altar. It had been the position of the magistrate in the apse of the Roman basilica which provided the model type—and sometimes were adapted as the structures—for early Christian basilicas. In the Middle Ages, as altars came to be placed against the wall of the apse, the practice of placing the cathedra to one side (mostly left) became standard. In the Roman Catholic Church since the Second Vatican Council, the altar is often free-standing. The cathedra in cathedrals built or renovated after Vatican II is sometimes placed behind the altar, as in ancient Roman basilicas. In Anglican practice, the cathedra tends to be placed to one side in the choir, although in more contemporary practice, it is commonly placed on the gospel side of the chancel (i.e., to the left of the altar, as one looks at it from the front). 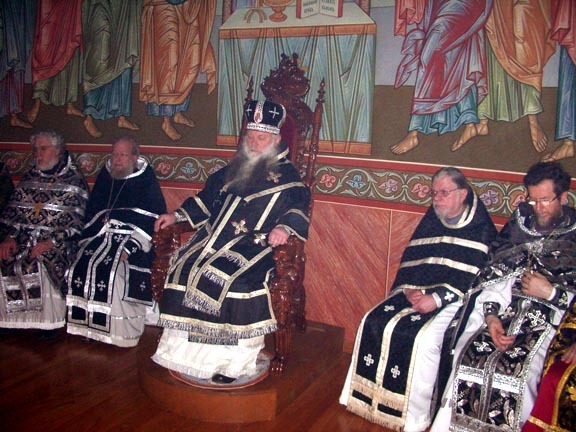 Eastern Orthodox and Byzantine Rite Catholic churches have a throne for the bishop in the apse behind the holy table, with seats for the priests (Greek: synthranon) arranged to either side. This location is referred to as the "high place" and represents the presence of Christ presiding over the services, even when the bishop is not present and therefore an icon of Christ is often placed above the bishop's throne. 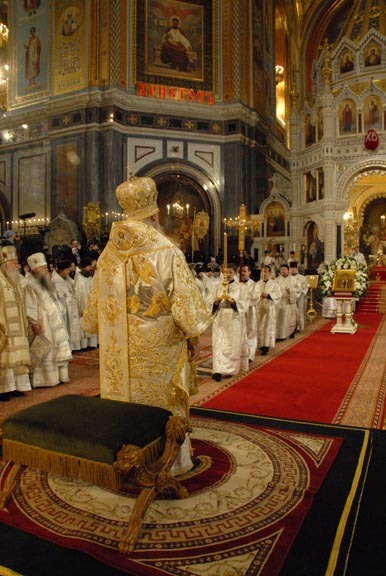 The bishop ascends to the high place only during the divine liturgy, at the Trisagion. For this reason, the consecration of a bishop takes place at the Trisagion, so that he may ascend to the high place for the first time as a bishop during the liturgy at which he is consecrated. In the Greek Orthodox Church practice, this is normally located along the southern wall of the church, on the kliros. In this style, it is one of the monastic choir stalls (kathismata), only more elaborately carved, usually at the top of three steps, and with a canopy above it. During the divine liturgy, the deacon ascends to this throne to read the gospel, facing west. 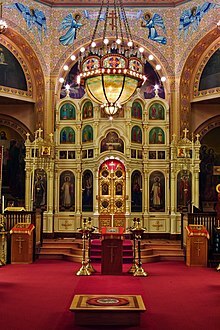 In the Russian Orthodox Church practice, the kafedra (Russian: кафедра, káfedra) is a large square platform set in the very center of the nave, with a removable chair or faldstool placed on it. This arrangement is a remnant of the ancient bemah (Greek: amvon), borrowed from the Jewish synagogue, which stood in the center of the church in ancient times. Sometimes during the liturgy, the deacon stands on this platform, facing east, to read the gospel. An orlets is usually placed at both the high place and the throne in the nave. 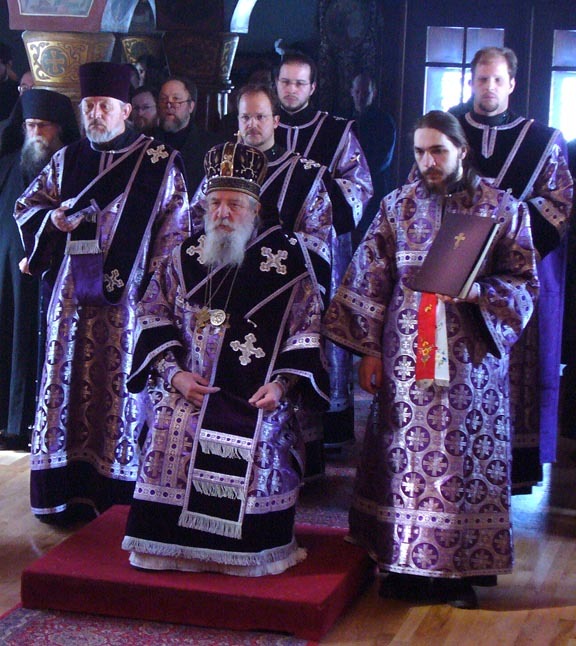 An orlets is usually kept permanently on the Russian kafedra, even when the chair is removed; the orlets is, however, removed when a deacon stands on the kafedra to read the gospel. ^ "Interior of the Basilica". Vatican State. Retrieved 20 March 2013. ^ "Welcome to Canterbury Cathedral". www.canterbury-cathedral.org. Retrieved 17 March 2018. Wikimedia Commons has media related to Cathedra.